Delta TechOps has new capabilities in Atlanta. 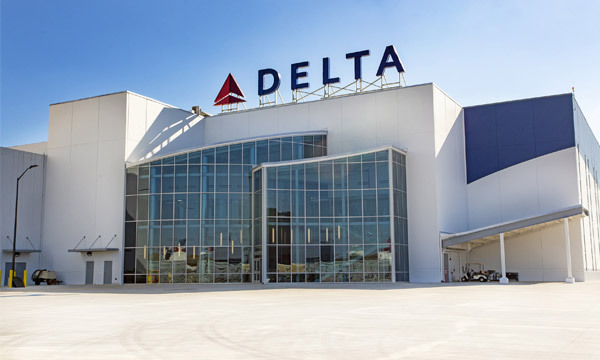 The MRO subsidiary of Delta Air Lines has announced that it has completed the construction of its new engine test cell. The structure is 14.6 metres tall, has a 20-metre air inlet section and a 23.8-metre exhaust section. The MRO company confirms that this is the largest engine test cell in the world and the first to be built in the United States for over twenty years. It is due to be inaugurated in February. This new installation will provide Delta TechOps with new maintenance capabilities since it will be able to conduct tests with engines reaching 150 000 pounds of thrust at full power, while its current test cell is limited to engines with 68 000 pounds of thrust. The company will then be able to work on Rolls-Royce Trent 1000s, Trent 7000s and Trent WXBs, as well as on the PW1100G and PW1500G variants of Pratt & Whitney's GTF. The first production test will be carried out at the end of 2019. Before this, the new facility will go through different steps including the proving and data validation for the cell, the commissioning of the cell with the Trent XWB engine, Trent 1000 Electric Start System installation, and Trent 1000 commissioning, correlation and production test. Delta TechOps is continuing its investment to extend its facilities and its service portfolio. In 2018, it launched a new state-of-the-art 11 800 m² Trent engine repair shop. The first engine inducted was a Trent 1000 operated by Delta's joint venture partner Virgin Atlantic. The company also added 10 000 part numbers to its spare parts inventory and opened a hot section repair shop to perform turbine section component repairs in-house. It also signed an agreement with Pratt & Whitney to become a major MRO provider for PW1100G and PW1500G engines. These successes have translated to a double-digit increase in the division's turnover, which has significantly exceeded 700 million dollars, according to the declarations made by Gil West, Delta Air Lines' Chief Operating Officer. While he is expecting this growth to slow down in 2019, he is still maintaining the objective of one billion dollars' turnover within five years.